Move your home or office with ease. Plan and execute your next move with EMOVE’s features like Checklist, Directory, CBM Calculator and a Photo Album.You can even use it to order packing cardboard boxes or ask for a Free Quote from Emovers, the largest moving company in town. Here’s what EMOVE can do for you. A comprehensive Before Moving and After Moving check list for moving home or office. You can also add your own checklist and tick it off when completed. Helps you plan your move and eliminates surprises. The checklists are also linked to useful addresses and phone numbers to help you get things done quickly. 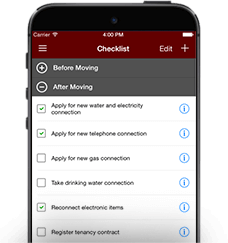 Our checklist also reminds you of your regulatory obligations like informing banks and government authorities after your move. Your moving company may require you to estimate the volume of your cargo before giving you a quote. 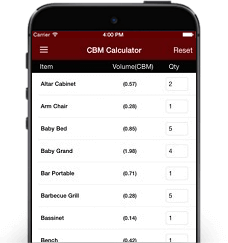 Use the CBM Calculator that computes the volume of your household items in cubic metre. CBM Calculator that computes the volume of your household items in cubic metre. A handy directory of useful addresses that you may need during your move. These include utilities, government agencies, and maintenance companies. The listing shows you the nearest company to your current location. Moving by yourself? Use the app to order cardboard boxes for packing if you are doing the move yourself. Place the order by email using the app to Emovers and have the cardboard boxes delivered to your place. Tell your friends, customers and colleagues that you have moved with an attractive announcement card. Send it through email, MMS, Facebook or Twitter. feature to ask for a no-obligation quote from us. connections and other stuff to help you reassemble in your new place. friend through email, SMS, Facebook or Twitter. Use the app each time you move and it will remember the moves in the history page. It’s as simple as that.